Am I someone who can leave one? Am I even worthy of a legacy? What I found is that a legacy is not achieved at the finish line but it is the journey itself. Are we leaving a path for others to follow? Are we bringing others with us? Taking Susan Bosak’s writings literally, I look back now on where my journey in imaging began. I joined the USAF as a radiology specialist in 1991. I was unable to afford to pay for college and was grateful for the opportunities the US military provided me. I had a desperate hunger for a field that combined compassion, technology, science, and medicine. I loved this field from the moment I entered it. While I am grateful for the education and clinical experience I received in the USAF, upon discharge I still knew nothing of CPT codes or how to properly bill one. I didn’t know the rules behind MRI zones. I most certainly had no idea how to conduct an interview and what questions to stay away from. When I took my first civilian leadership role, my director at the time told me about the AHRA and recommended I get connected. I can honestly say that one recommendation that changed my life completely. After joining the AHRA my career took off like a rocket. With every step I took, new challenges presented themselves. It would have been easy to simply focus on the steps before me and not on those around me who were also trying to find their path. But I was so grateful for the help the AHRA provided me I wanted to share it with everyone. I was bound and determined to ensure that the leaders who worked with me also got connected to the AHRA and actually used its resources. Looking back I can say the ROI of my AHRA membership has proven itself over and over again. When I left my first job the lead techs working for me were all promoted to supervisors of their areas. When I left my second job, director of imaging, my manager became the director and my CT lead tech became the manager. In both cases, they were all ready for that next step. I saw it, their teams saw it, and hospital leadership recognized it. Even when they went toe-to-toe with outside candidates who may have been more experienced leaders, they were all selected and yes, they were all AHRA members. What made the difference? I’d like to think it was a ripple effect. My supervisor recommended connecting with the AHRA to me and I shared that knowledge and recommendation with them. When they were ready to take their next steps, they had the collaborative power of the AHRA to bolster them. Now, 24 years later, my career is still moving forward and yes, I still hold tight to the AHRA. 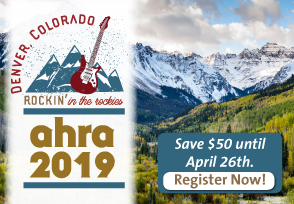 It doesn’t matter what position you are in – front line lead tech, supervisor, director, VP, or CEO – as long as healthcare keeps changing we will always need to stay connected to each other through the AHRA. Just as my director guided me all those years ago, I have found others along the way eager to find their own paths. A legacy is not a destination, but a journey. Will you walk alone or will you join the AHRA in lighting the path for others? Bosak S. What is Legacy? The Legacy Project. Available at: http://www.legacyproject.org/guides/whatislegacy.html. Accessed April 10, 2015. Angelic P. McDonald, MSRS, CRA, RT(R)(CT)(MR), FAHRA is the director, cardiovascular imaging at Houston Methodist DeBakey Heart and Vascular Center in Houston, TX. She can be reached at apmcdonald@houstonmethodist.org. Wow! Absolutely inspirational and a great call to all of us to take chances, be active in our own development and the development of our teams, and create our own legacies. Thank you for this fantastic boost of inspiration on a Friday!